Philip Nolan and All the Pretty Horses. Not only could wild horses not keep Philip Nolan away from Texas in the 1790s, they were the reason he kept coming back here and the reason he died here. Other more nefarious motives have been suggested as the real reasons for his Texas expeditions, but we believe now that Philip Nolan was here for the horses. Nolan was born in Ireland and came to the U.S. when he was 17. He was a prot�g� of Gen. James Wilkinson of Kentucky, who was a friend of Thomas Jefferson and an associate of Aaron Burr, a man who tainted history's perception of almost everyone who knew him. Nolan represented Wilkinson's business interests in New Orleans, where the Irish lad first heard stories of the vast numbers of horses running wild and unbridled in the western province of Texas. In 1792, with Wilkinson's help, Nolan, barely 20 years old, received a passport from the governor of Louisiana for a trading expedition in Texas. It didn't go as planned - his trade goods were confiscated -- but he spent two years living with the Wichita and Comanche tribes and learned a considerable amount about horses. The Comanches had reinvented themselves with the introduction of horses into their culture and used the animals to their advantage more than any tribe in history. Nolan said he found "the savage life�less pleasing in practice than speculation." Spanish authorities hailed Nolan as having "risen from the dead" when he returned from that first expedition, not only alive but with 50 wild horses. The next time he went to Texas he came back with 250 more horses and took several of them up the Natchez Trace to sell in Frankfort, Kentucky. A new economy was slowly taking shape. The next time Nolan went to Texas he brought back more than a thousand horses and sold them in Natchitoches, New Orleans and Kentucky. This is about the time that Thomas Jefferson, who probably heard of Nolan's exploits from Wilkinson, began thinking seriously about the concept and reality of wild horses. The only horses he and his fellow easterners knew of were thoroughly domesticated. Jefferson wanted a chance to record "the only moment in the age of the world" when the horse could be studied "in its wild state." The soon-to-be third president sent a letter asking Nolan to visit him at Monticello and also to bring one of the pretty western horses with him. Nolan got as far as Kentucky where, for reasons unknown, he turned around. Later that same year he made a fourth expedition to Texas, this time without a passport from the Spanish government, which now viewed Nolan with increasing suspicion and hostility. The Governor of Natchez, Manuel Gayoso de Lemos, wrote to the viceroy of Mexico that foreigners like Nolan were working to turn the Texas Indians against Spanish rule. The Spanish also looked askance at Nolan when he returned from a mapping expedition in the company of Andrew Ellicott, boundary commissioner for the United States. Without the official protection of the Spanish government, Nolan took 21 well-armed men with him on his final expedition in 1800. It wasn't enough. Nolan was killed in March of 1801 by Spanish soldiers who attacked the expedition after they refused to surrender. Philip Nolan was the only member of the expedition to die in the attack. Seven of Nolan's men escaped. The rest were captured and imprisoned. Because of his association with Wilkinson and Wilkinson's association with Burr, it's been widely speculated that Nolan was part of Burr's scheme to claim much of the west in his own name, or at least under his own rule. Most historians today feel that's not true - he was there for the horses. And the money. Nolan, the original Mustanger, has been treated by history mostly as a footnote or as a subject of speculation. His name also became associated with a well-known work of fiction, "The Man Without a Country" by Edward Everett Hale, who later wrote a piece called "The Real Philip Nolan" to clear up any confusion about which Philip Nolan was real and which one was not. 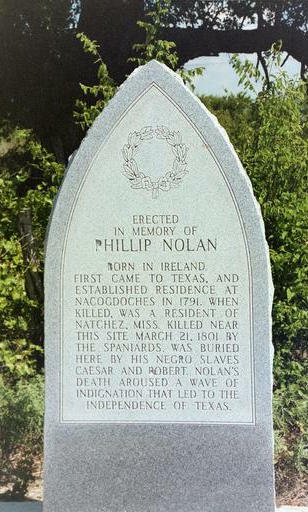 There may be more poetry than truth in casting the real Philip Nolan as a man without a country - he seems to have been loyal to any flag that protected him - but the place he no doubt claimed as his heart's country was the horse country of Texas.